After Venezuela, Germany, Austria and the Netherlands prudently repatriated a substantial portion (if not all) of their physical gold held at the NY Fed or other western central banks in recent years, one month ago Turkey announced that it too has decided to repatriate its gold stored in the US Federal Reserve and deliver it to the Istanbul Stock Exchange, according to reports in Turkey's Yeni Safak. As we reported at the time, it wouldn't be the first time Turkey has asked the NY Fed to ship the country's gold back: in recent years, Turkey repatriated 220 tons of gold from abroad, of which 28.7 tons was brought back from the US last year. And now, according to a report by the Swiss Schweiz am Wochenende, the repatriation is complete with the Turkish central bank withdrawing all of its gold reserves from the U.S. due to the "tense political situation." However, in a strange twist, instead of moving the physical gold to Istanbul as the Turkish press reported in April, the Swiss newspaper notes that around 19 tons of Turkish gold is now stored at the Basel-based Bank for International Settlements. It was not immediately clear why Turkey would shift its gold from the NY Fed to the BIS, whose historical "gold rehypothecation" tendencies have been well documented over the years. 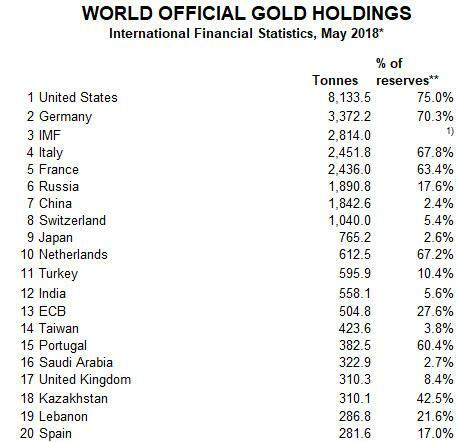 According to the latest IMF data, Turkey’s total gold reserves are estimated at 596 tons in May, up 5 tons since April, and worth just under $23 billion, rising 40% over the past year. This makes Ankara the 11th largest gold holder, behind the Netherlands and ahead of India. Turkey's gold repatriation come at a sensitive time for Turkey's currency, the lira, which has been pounded for the past month, and plunged to all time lows against both the dollar last week amid double-digit inflation in Turkey, as the central bank continues to be terrified of President Recep Tayyip Erdogan, and refuses to raise rates. Meanwhile, Erdogan has taken a tough stance against the US currency, criticizing dollar loans and stating that international loans should be given in gold instead. “I made a suggestion at a G20 meeting. I asked: Why do we make all loans in dollars? Let’s use another currency. 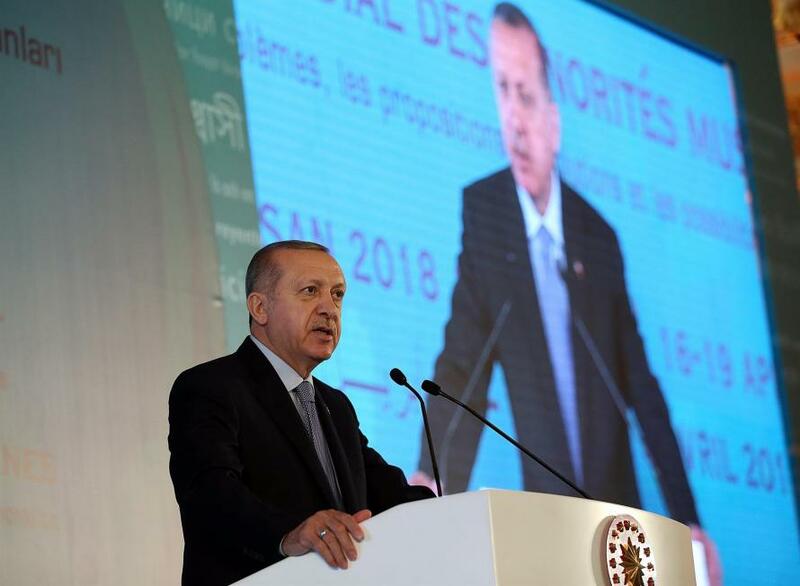 I suggest that the loans should be made based on gold,” Erdoğan said during a speech at the opening ceremony of the Global Entrepreneurship Congress in Istanbul on April 16, Turkey's Hurriyet reported. In what some saw an appeal for a gold standard by the Turkish president, Erdogan added that “with the dollar the world is always under exchange rate pressure. We should save states and nations from this exchange rate pressure. Gold has never been a tool of oppression throughout history." In other words, Erdogan's latest excuse for the crashing Turkish Lira was that there was not enough physical gold back home to launch a gold-backed currency. And now that Turkey just repatriated even more gold from New YOrk (even if it mysteriously ended up in Basel), Erdogan will be able to launch a gold-backed currency if he so desires. Unfortunately, as we said last month "all signs point to the gold being repatriated only so it can be raided, pillaged and promptly deposited in offshore vaults by members of the ruling oligarchy." Seen in this light, one wonders if Erdogan has not cut a deal with the BIS to "deliver" Turkey's gold to Basel, providing some much needed yellow metal in a world in which the ongoing global physical gold shortage prompted banks to scrap reporting the gold forward rate (GOFO) - a benchmark of physical gold scarcity - in January 2015. As noted above, Turkey has been one of several countries which have moved their gold from the world's biggest, and allegedly most secure gold vault, that located 95 feet below sea level at 33 Liberty Street in Manhattan, better known as the New York Fed. 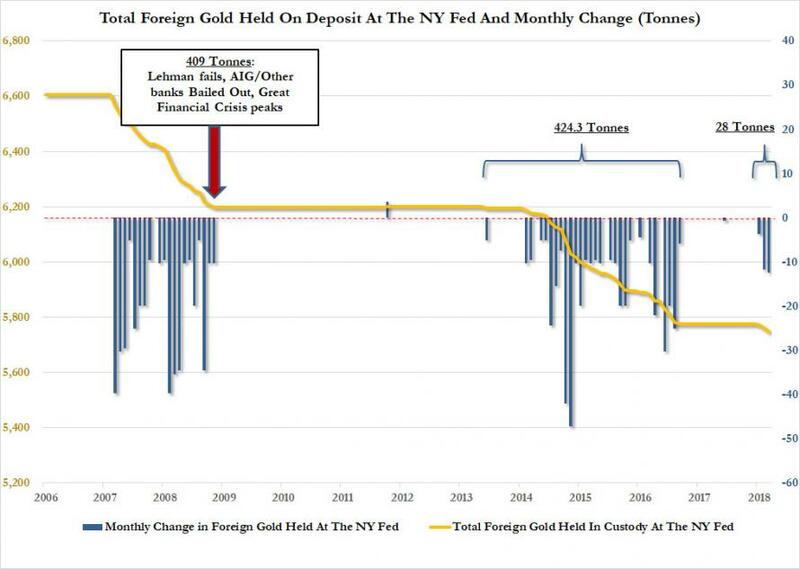 As a result, according to the latest Fed data, the amount of physical gold stored at the NY Fed has dropped to the lowest on record, or 5,750 tonnes, following a withdrawal scramble that started in 2014 and continued until the end of 2016. After a 15 month hiatus, withdrawals resumed in 2018, with 28 tons of gold repatriated between January and March, an amount which we assume is mostly Turkey. “The central banks started the repatriation a few years ago, meaning before we had Brexit, Catalonia, Trump, AFD or the rising tensions between the Politburo in Brussels and the nations of Eastern Europe,” Claudio Grass of Precious Metal Advisory in Switzerland said recently. According to him, the world is becoming less centralized. “If we follow this trend, it should be obvious that the next step should be an even bigger break up into smaller units than the nation state. With such geopolitical fragmentation comes also the decentralization of power." Perhaps... but until that happens, the NY Fed still hold the world hostage thanks to its custodial holdings of 5,750 thousand tons of foreign-owned gold.